with surprise Guest Presenters and skyped in Global Instructors. H Larry Elman took the Dave Elman Course in Medical Hypnosis three times as a teenager and studied alongside physicians and dentists. He grew up hearing discussions of his father's methods of hypnosis. Larry did a short stint as a stage hypnotist when he was a teen so he, too, had subjects on whom to practice. After 40 years in Aviation, a career in the Air Force, and as a College Professor, Larry has turned back to the "family" business. It is his passion to share his father's Hypnosis Methods globally. Larry is a Certified Hypnotist and Certified Instructor. Since 2009, Larry has presented around the country at numerous Conferences, such as NGH, IHF, ACHE, IACT/IMDHA, MAHC, CHC, HypnoKongress, and others. Larry and his wife Cheryl have taught in 18 countries on 5 continents. They have produced excellent quality DVD products teaching the methods of Dave Elman with Sean Michael Andrews (Don Patterson) and a bi-lingual course with Hansruedi Wipf (OMNI), which was filmed with both German and English tracks. 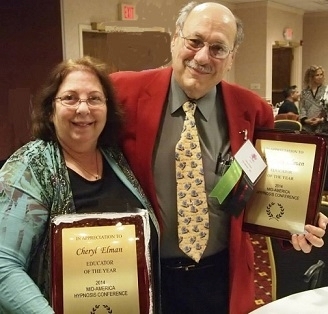 Cheryl J Elman is President of the Dave Elman Hypnosis Institute, practices as a hypnotherapist, co-instructs, and is the DEHI marketing force both domestically and abroad. Her unique background as an artist/teacher, HS Special Ed teacher, business/marketing executive, and entrepreneur helps to build DEHI and adds creativity to her hypnosis sessions. She has a BS in Special Ed and Elementary Ed from Syracuse University, which has been an asset in her positions as both a Goulding Process of SleepTalk for Children Consultant (working with parents around the world), and is an Accredited SleepTalk Trainer teaching the process to hypnotists, teachers, and other professionals. She is a Certified Hypnotist with NGH and IACT and a Certified Master Trainer with IACT and IMDHA. Her experience as an artist, a Director of Sales and Marketing, a teacher and trainer blends into a creative approach to teaching hypnosis and starting your business. Her enthusiasm and humor are energizing whether training or presenting at conferences including the NGH, IHF, the IMDHA/IACT, MAHC, HTL, CHC and in several cities in Europe and Australia and North America. we include much of Dave Elman's highly successful Methods and Techniques. C Roy Hunter's "The Art of Hypnosis"
Topics covered through presentation, discussion, and daily Practice. Study of some of Dave Elman's methods through "Hypnotherapy" book & recordings of Dave Elman's Medical Hypnosis Course. LIMITED AVAILABILITY... SO SIGN UP TODAY!